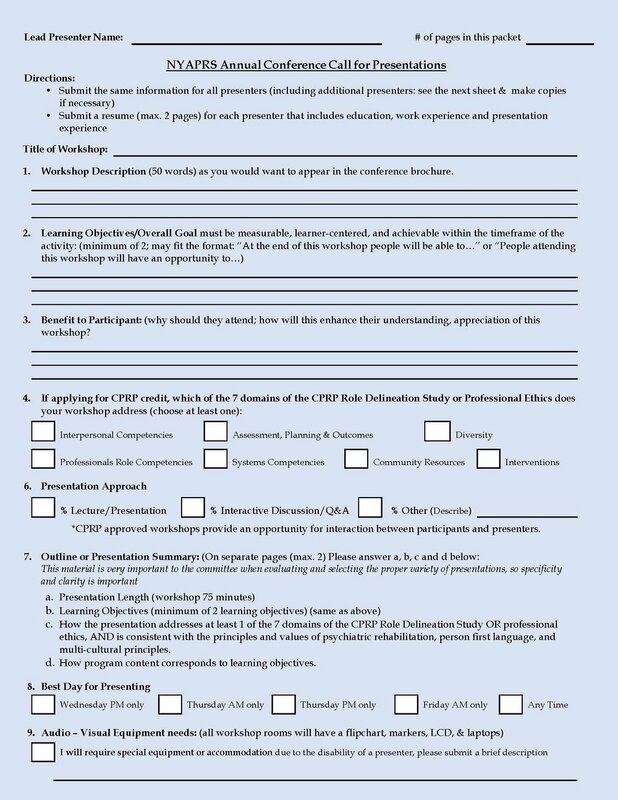 NYAPRS Releases 2018 Conference Call for Presentations! 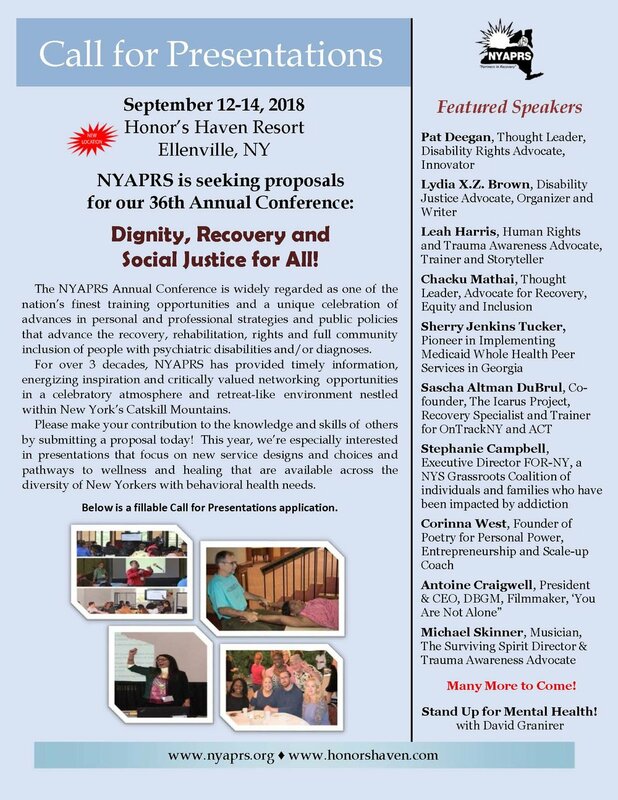 NYAPRS Note: The NYAPRS Conference Committee and staff are very pleased to release our Call for Presentations for this year’s Annual Conference, to be held September 12-14 at a new site this year at the Honor’s Haven Resort in Ellenville. The Honor’s Haven, which has long been a very popular alternative site to the nearby Hudson Valley Resort, will allow us to offer all of the special events and atmosphere that thousands have loved for so long and much more, in the same Catskills Mountain environment and for the same one-price-for-all arrangement. This year’s theme, “Dignity, Recovery and Social Justice for All” reflects the key values and aims of our ever expanding community. It seeks to underscore that, ultimately, there can be no full recovery without achieving both a personal sense of dignity and an explicit commitment to address the injustices of all forms of discrimination, poverty, racism, criminalization, hunger and homelessness. We are very excited that Pat Deegan, who coined the term ‘the dignity of risk’ almost 2 decades ago, will be a featured keynote speaker in an ever growing lineup of inspiring thought and innovation leaders that will include Leah Harris, Chacku Mathai and Sacha Altman duBrul and that will once more bring back our hilarious and touching Stand Up for Mental health comedy show. Stay tuned over the next few days to hear more about our presenters and special events! 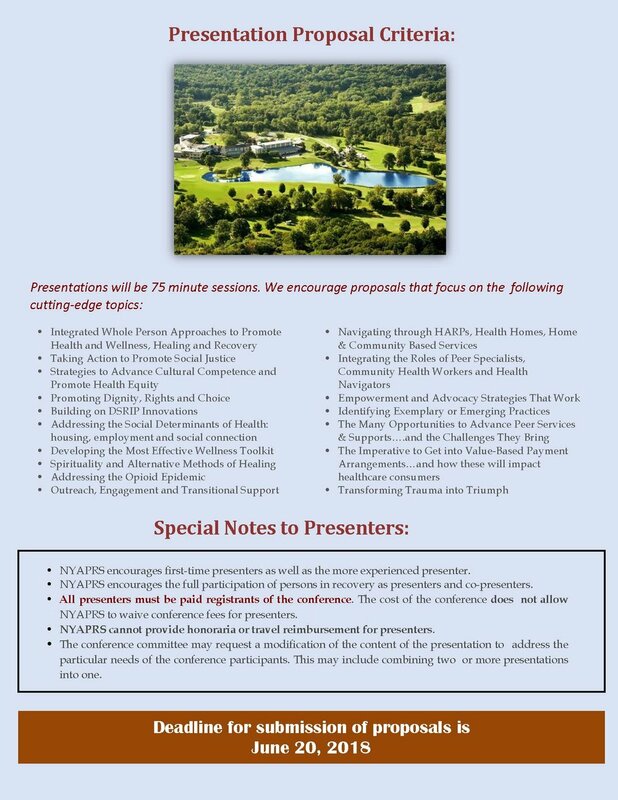 Click here at Call for Presentations or at https://static1.squarespace.com/static/58739f64e6f2e14a3527a002/t/5b11700570a6ad5e4ceecdfe/1527869445528/Conference+2018+-+Call+for+Presentations.pdf to send us your proposal in pronto: this year’s deadline is June 20. See you in September!